Fabled Feraligatr - Pokemon One a Day, Series 2! Across the seas of the world, a living legend among marauders and thieves continues his plight for treasure and infamy. 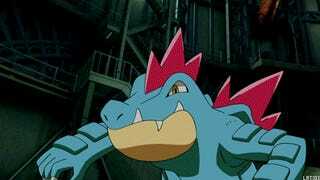 Who would have thought that a ruffian like Croconaw would amount to becoming the feared and powerful pirate, Feraligatr? The Totodile line evolves without any specific theme and failes to give the creatures a distinction which is what forced my hand to create today's seafaring captain. Feraligatr isn't special in its design so I decided to spruce him up by concocting a little story and giving him a plethora of details throughout the subject to tell them. Scars, self inflicted and through battle, a tattoo, his physique...All of this amounts to an illustration I am incredibly proud of. My first draft was far more cartoony. In fact, my inspiration was Donkey Kong and the Kremlin line of enemies. I wanted to do something cartoony and fun - I did promise more parodies of existing franchises for this series run while the first run was more focused in schools of fine art. As I pushed through with the original draft, I felt the image was lacking "oomph". I really enjoyed my first linework, but the creature felt less intimidating than what I had planned. The caricature of a muscly pirate was...dare I say it...ready to walk the plank. Well, that's not entirely true. I thought I could mix the caricature element with some pseudo realistic painting applications. I paid more attention to anatomical elements and slowly but surely, I began to paint in scars, bumps, scales, vein and muscles, and more. I wanted to add reptillian features like crocodile skin and add spikes down his tail as well as make his red scales more rugged and worn. I treated his overall physique to the tune of one thought - a lumbering brute. All about that bass and no treble. He had to have a bit of a belly, but be ripped and appear to be immovable against all force. His face had to look weathered and fierce, with eyes that would never blink in the raging winds of a storm. To achieve that look, I was actually inspired and painted details to resemble Clay Morrow of Sons of Anarchy, played by Ron Perlman. He had the perfect look and concept of character that I instilled to the face and poise. Obviously if you couldn't tell, this is the piece I've spent the most time on yet. It's gone through quite a progression and I'm really happy with how it came out. I'd like to note that I don't think I would have been able to execute this piece visually if it weren't for all the practice I had with series 1. 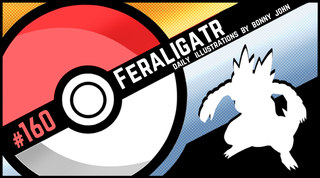 You are the Feraligatr of my illustration. Who is your crew of Pokepirates? You have one right hand man and one prospect...Go! Exploring the creatures of Gold and Silver, Pokemon One a Day, Series 2 can be seen as both a standalone project and expansion to the original marathon of artwork that sought to present one unique new illustration per day. This project builds upon the exploration of personal technical and philosophical concepts and visual styles under daily deadline to create quality works for personal and professional growth.